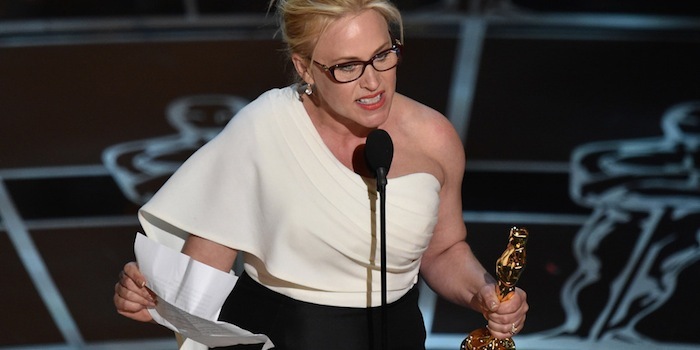 Above: Patricia Arquette speaking on feminism during the Academy Awards. ABC. This statement is just as true today. While women are performing the same jobs as men, they are still only earning 77 cents to the male’s dollar. Gender wage discrepancies in the entertainment industry are even more terrifying. Women behind the camera are discriminated against just as much as women in front of the camera. Over the past five years at the Academy Awards, only nine women are among the 50 people nominated for Best Original Screenplay and Best Adapted Screenplay. Of those nine women, only four wrote films with storylines mainly focused on women. Debra Gralnik and Anne Rosselini were nominated for “Winter’s Bone,” which featured Jennifer Lawrence as the lead. Neither of these groups of women took home the prize. In 2014, the gender pay gap was obvious in the screenwriting industry. White male screenwriters earned an average of $80,000 per year, while female screenwriters only earned an average of $61,776. Looking at female directors is no better. In Hollywood, only 6 percent of directors who worked on the top-grossing films of 2013 were female. This means 94 percent of the blockbuster hits we watched in 2013, regardless of who wrote it or who starred in it, came from a man’s point of view. At the Academy Awards, nominated for Best Director — only four women since 1927. That does not even seem fathomable. Actresses in front of the camera are normally no different; yet, sometimes, women do earn equal to or more than what men make. In 2014, Sofía Vergara and Ashton Kutcher were the highest paid female and male television stars, taking in $37 million and $26 million, respectively. This is one of the rare occasions when a woman has made more than a man in the entertainment industry. Though, it is not unheard of for men and women to have equal pay on television. The cast of “Friends” made history when all six cast members began making $1 million per episode in their ninth season. Jennifer Aniston, Courteney Cox and Lisa Kudrow became the highest paid women in television history. Another actress is determined to have her whole cast earn the same, as well. Viola Davis has said that if “How to Get Away with Murder” becomes a huge success, she wants the whole main cast to band together and demand equal wages. In other Shondaland shows, the women are the top earners. Ellen Pompeo makes $350,000 per episode on “Grey’s Anatomy,” a salary only matched by Patrick Dempsey until his character’s recent death. And, Kerry Washington is the top earner on “Scandal,” with $150,000 per episode. Looking at film, Robert Downey, Jr. was the top paid actor of 2014 with $75 million, while Angelina Jolie was the top paid actress with $33 million. You would have to go down to the ninth top paid male actor (Will Smith at $32 million) to get about equal with women. To put it into a bigger perspective, Meryl Streep, the actor with the most total nominations at the Academy Awards, only earned $10 million in 2014. Justin Bieber, on the other hand, made $80 million. Does it seem right Streep only earned an eighth of what Bieber made? Doesn’t it seem time for a change? This article first appeared on Elite Daily on May 5, 2015 and can be found here.